January is Learn to Ski and Snowboard Month on the snow in Pennsylvania and ski areas are celebrating by offering great discounts to those who want to learn. Tens of thousands of winter enthusiasts migrate to the slopes in Pennsylvania every week to ski and snowboard on trails that truly offer something for everyone. You can have quiet comfort in a fantastic setting or the excitement of a downhill course. If you don’t know how to ski or snowboard, you’re in for an exciting experience! Are you one of those people? It’s easier and more affordable than ever to pick up the sports. For the month of January, the 21 member resorts of the Pennsylvania Ski Areas Association will offer $5 discounts on already low midweek “Learn A Snow Sport” packages. Check out this map to find a ski area close to home. These very special tickets include a first ski lesson, rental equipment, either skis or a snowboard and a lift ticket for use on any of the beginner areas. This offer can be found here. In addition to that offer, a number of ski areas have individual deals that can help you join in the fun! On select dates in January, Blue Mountain is offering a $35 First Time Lesson Package, a savings of 50%. 1 Open to close equipment rental and 1 group lesson. Package will be available throughout the month of January beginning January 2, 2014. Package is available on Tuesdays, Wednesdays, Thursdays and Sundays. Lesson times will be 10am, 2pm and 6pm. The only blackout day is Sunday, January 19, during MLK. Learn to Ski/Snowboard Package includes lift lesson and rental Monday-Thursday during January excluding MLK Monday. 2. Make it a getaway! 3. Bring a Friend! Help a friend learn for FREE! (Season Pass and Advantage Card holders can introduce a friend!) Advantage Card and Season Pass holders can bring a friend for a Special FREE VIP Learn to Ski or Snowboard Package! Available opening day through December 23, 2013, and Tuesday through Friday for the entire Month of January, 2014! Learning is easy, fun, and affordable! January is Learn to Ski & Snowboard Month and Montage Mountain is celebrating with 1/2 price lesson packages! Lessons are available for ages 6 and up for skiing or snowboarding. Winner of the 2011 Conversion Cup recognizing the best program for introducing new skiers and snowboarders to the sport. Every Tuesday in January, their Learn to Ski and Snowboard packages for ages 4 and older are only $39.00, that’s up to a 55% savings. All new skiers and snowboarders who complete their first timer’s lesson may purchase a Mountain Passport. The Passport entitles the holder to a complete package for their next visit, 40% off lift tickets and rentals for subsequent visits and one FREE class lesson per visit. Ski Big Bear will be highlighting the Ski Big Bear Learners’ Permit. This is a beginner program. It will include a lift ticket, rental equipment and a group lesson for 3 Sundays in January excluding Martin Luther King Weekend Sunday (1/19/14). The cost for a Junior Permit (ages 6-12) is $145 and an adult permit (ages 13 and above) is $165. Learn to Ski or Snowboard Packages for everyone ages 8 and up are only $39 every Wednesday the entire month of January! Mom & Dad, we will even toss in FREE with purchase of a ‘Learn To’ Package! 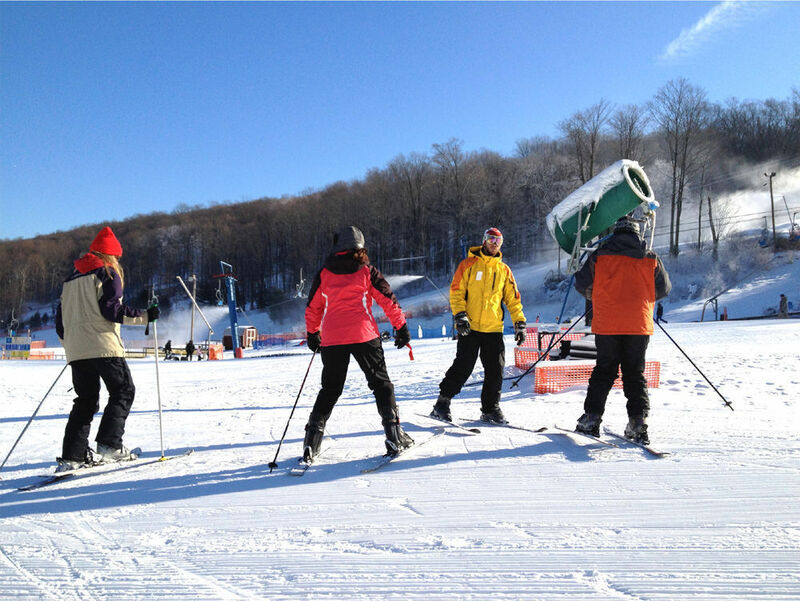 $39 Learn to Ski & Board packages are valid for an all day beginner area lift ticket. No reservation needed! Packages include a beginner area lift ticket, rental equipment and a ‘First Time’ lesson. Child Care is only available until 5pm. Reservations are required for Child Care – please call 717-328-9400. Use this link to a find a Pennsylvania Ski Area near you now. Check out the complete Learn to Ski and Snowboard Month Page for more information about the top Pennsylvania mountain resorts.